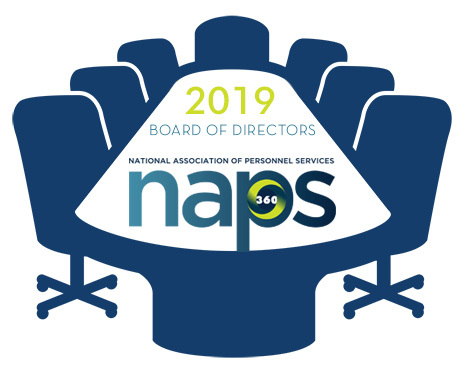 DAWSONVILLE, GA (January 2019) - The National Association of Personnel Services (NAPS), the nation's leading search, recruiting, and staffing industry educator and oldest industry association, is proud to announce the 2019 NAPS Board of Directors. The 2019 NAPS Board will be guided by the new Executive Committee, with new Chairwoman, Glenna Cose Brin, CPC, at the head of the ship. Cose Brin, President of AllianceStaff LLC, said, “I’ve been in the recruiting business forever! I was lucky enough to start in this crazy and intoxicating business, working for the most successful national (Dunhill) franchise for many years, and learned the meaning of success and high goals from an early point in my career. After being VP of Dunhill of Milwaukee, and then working for the corporate Dunhill entity for another 10 years, I eventually opened up AllianceStaff in 2006 in order to stay focused on what I love - solving problems and helping others. My philosophy in life comes from an old Zig Ziglar quote: “You can get everything you want in life if you just help enough other people get what they want.” And that mantra has served me well. Serving alongside Cose Brin as new Board Chairwoman is Tom Erb serving as Chairman Elect, Ryan Scott, CPC as Vice Chair, and Melody Cristo, CPC, now part of the Executive board, as Secretary/Treasurer. The organization gives many thanks to a fantastic job done to Immediate Past Chairman, Bruce Putman, CPC served as Board Chairman through 2018 and has officially passed along the torch to Cose Brin. In addition to the new Executive Committee, we are proud to announce some returning Directors and Advisory Board members. The 2019 Directors are comprised of David Adams, of Careerlink Network, Meredith Daly, CPC, of Advanced Search & Placement and Teresa M. Delibert, CPC of Delibert Employment Solutions. Rounding out the full Board of Directors are our two Advisory Board members, Mark Demaree of Top Echelon and Amy West of People 2.0. The 2019 NAPS Board will convene in January to discuss plans and initiatives for the new year. Since 1961, NAPS has been a leading industry educator in the United States. As the oldest association representing the search, recruiting and staffing industry, NAPS offers the longest and most comprehensive history of professional credentialing in the industry. NAPS continues to maintain the esteemed position as the industry educator through its certification program, continuing education initiatives, eNewsletters and its annual conference. For more information on NAPS, visit www.naps360.org.